December 4, 2018 at 12:08a.m. Photo by William D. Lewis | Camden Hergenrother, left, of Cardinal Mooney High School, defends against Boardman High School's Bailey Moore during Monday night's action at Mooney. The Cardinals downed the Lady Spartans 60-46. 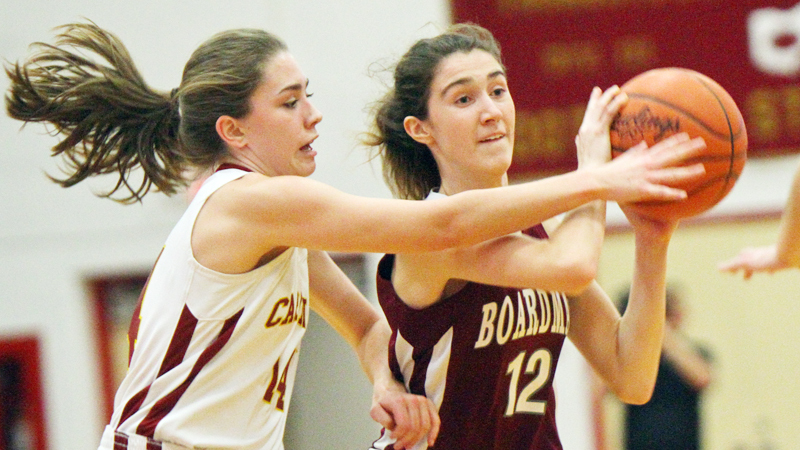 Conchetta Rinaldi had a season-high 25 points, Katie Hough added 14 and Cardinal Mooney used a 13-2 third quarter run for a 60-46 victory over Boardman on Monday night. Rinaldi scored her team’s first four points, then combined with Hough for all 15 points in the opening session to help the Cardinals (4-0) to a 15-11 advantage heading to the second period. “This start doesn’t surprise me because our girls work very hard. They play together and are getting better each time they hit the court,” Mooney head coach Jason Baker stated. “We needed to be aware of Boardman defensively, but do our thing offensively. We wanted to move the basketball side to side, open the driving lanes and when their defense collapses, then we have players who can also make shots from the outside. Two free throws by Boardman’s Maria Torres and a bucket by Katie Stamp at 4:40 of the second period made it 19-15 in favor of the Cardinals, but Carolyn Kay’s two buckets from beyond the arc keyed a 14-6 Mooney run as they built a 33-21 halftime advantage. Two hoops by Rinaldi to start the third quarter increased the Cardinals’ advantage to 37-21, but six points by Torres ignited a 9-0 Boardman (1-1) run to cut the deficit to 37-30. After two free throws by Hough made it a 39-30 game at the 3:30 mark, five points by Torres helped the Spartans score seven of the last nine points of the period to cut the deficit to 41-37 heading to the final quarter. After a Camden Hergenrother free throw, Stamp’s bucket in the lane cut the Mooney lead to 41-38 just 70 seconds into the final frame only to have the Cardinals reel off 13 of the next 15 points for a 55-41 lead. “We have nice chemistry right now and if we keep playing like this, then only good things will happen,” Hough said. “We committed too many fouls in our first three games, so tonight we wanted to work on our defense and stay out of foul trouble. I think we accomplished that. Spartans head coach Jeff Hammerton could only watch as his team was outscored 18-7 over the final 6:50. “We cut the lead to three points, got a stop but then had back-to-back empty possessions,” Hammerton said. “We turned it over and panicked a little during a key stretch. It’s tough to play catch-up, but it’s only our second game. Torres was the only Spartans player in double figures with 19. Boardman committed 26 turnovers to just 12 for Mooney. November 30, 2017 12:07 a.m.
January 5, 2017 12:07 a.m.
January 13, 2012 12:06 a.m.
December 13, 2018 12:10 a.m.